You've outgrown your electric log splitter or your 7-ton gas-powered machine. You want to upgrade to a more powerful splitter, and you've come across the Champion 92221 22-ton splitter as a possibility. It's got some good reviews on Amazon, but you don't want to take the time to read through them all. Good news! We've done that for you and summarized all the important facts about this splitter, so you can make an informed decision. We think you will be impressed. Champion Power Equipment is a fairly young company, in business only since 2003. It is based in California, and also has facilities in Tennessee, Wisconsin, and Toronto. It makes generators, engines, winches, and log splitters. Generators are its main product line. Although it is a U.S. company, the 92221 is manufactured in China. New 25 Ton. In 2016, the Champion 92221 22-ton log splitter was replaced by a 25-ton splitter, the model 100251. The most significant differences between the new splitter and the previous model are the increased engine capacity and pump power, which results in the increase from 22 tons to 25 tons splitting power. The 100251 increases the engine size from 190 cc. [CHECK] to 224 cc., and the pump from 11 GPM at 3500 PSI to 11 GPM at 3900 PSI. The return time is down to 12 seconds from 14 seconds. This means that with no downtime at all, you could run 300 cycles an hour, up from 257. Unless you are running a 3 or 4 person operation, this increase will probably not make a difference to you, as you won't be able to keep up. Other details are that the 200251 is about a foot longer than the 100251, at 71.3 inches vs. 58 inches, is about 34 pounds heavier, uses slightly less hydraulic fluid (5 gal. vs. 6.5 gal. ), and has a very slightly smaller fuel tank (.1 liters less). This newer more powerful model is around $650 less expensive than its predecessor with free shipping from Champion on Amazon. More power for less money - sounds like a good tradeoff! This splitter is powered by a Champion 196 cc, OHV 4-stroke engine. 4-stroke engines are the usual engines for gas-powered log splitters and many other pieces of small equipment. Champion does not specify the horsepower or torque for this engine. Users have described it as between 5 and 6.5 HP. Many other log splitter manufacturers use third-party engines, such as Honda or Briggs and Stratton, both of which have solid reputations. Champion Power Equipment, as a newcomer to the market, does not have as much of a reputation, but a careful review of the 52 reviews and 24 answered questions for this product on Amazon turned up very few complaints about the quality of the engine. Indeed, most of the comments praised it as reliably starting up on the first pull, even in cold weather. Champion specifies that the sleeve on this engine is cast iron. This is a more expensive option than an aluminum sleeve, but it is not clear if it really has significant advantages in this type of application. Iron is more durable overall, but aluminum may be less prone to corrosion. There is some advantage to cast iron if the engine is going to be rebuilt, but very few people would bother to rebuild the engine on a 22-ton log splitter - they'd just go out and get a new one. The engine and the pump are equally important in determining the power and reliability of a log splitter. The Champion 92221 has a 2-stage pump with a flow of 11 gallons per minute, and a maximum pressure of 3500 PSI. This is comparable to the pumps on all splitters of this size. This splitter has a 6.5 gallon hydraulic fluid reservoir - again, comparable to competitors. This pump has the ability to self-adjust for load and no-load situations, which means that when the cylinder is retracting, the pump and engine do not have to work as hard. A 22-ton splitter should satisfy the needs of most homeowners or small landholders. Reviews by customers on Amazon report that it handles logs up to 48" in diameter. That being said, the specs for this spliter list a maximum log weight of 100 pounds. Presumably, this refers to using the splitter with the cylinder in the horizontal orientation. With really large diameter logs, the vertical position will be preferable, and the weight of the log immaterial. However, some reviewers noted that with the cylinder in the vertical position it is difficult to move the splitter. Fortunately, switching back to horizontal is a simple operation that takes just a few seconds and a pull pin. The 14 second cycle time for this splitter is right up there with the fastest in this class. It means 4 cycles per minute. One reviewer asserts that a 2-person team can easily split a rick of wood (approximately 1/3 cord) in 10 minutes. This translates to about 2 cords an hour, at a consistent pace. An advantage this splitter has over some of its competitors is that the operator stands forward of the engine and the hydraulics. Other models require the operator to stand at the rear of the splitter, which makes him unable to load and unload the splitter without walking several steps. This makes one person operation easier, and 2-person operation more efficient. This splitter ships unassembled. Because of the weight of some of the parts, it really takes two people to assemble it. Thetime required is about 2 hours. The owner's manual for this splitter is exceptionally detailed, with step-by-step assembly instructions that include diagrams for many of the steps, information on starting and operating the splitter, and specific maintenance recommendations. Champion prides itself on its customer service. It provides lifetime technical assistance for all its products. It provides a 1-year limited consumer warranty on this log splitter. The commercial warranty is only 90 days. Champion relies on local service providers for warranty service. It has more authorized service centers in some states than others. You can find the nearest service center to you here. [http://www.championpowerequipment.com/sales-service/where-to-buy/home-standby/] This can be an important consideration, especially when buying online. For example, there are very few authorized service centers in Vermont and Maine. Of the 52 reviews on Amazon, a whopping 79% are five stars, and another 11% are four stars. That's 90% 4 stars and up!!! The two one-star reviews lack detail. Of the two 2-star reviews, one is from a customer who had trouble with the engine right off the bat, and one is from someone who only reports that it "broke after two weeks". It is not clear whether either customer took advantage of the Champion warranty. The vast majority of the reviewers and question answerers love this splitter, and are impressed with what it can handle, saying thigs like "VERY easy to operate", "When you need the best buy this one", "Works like a champ", and "Amazing machine, very well built". 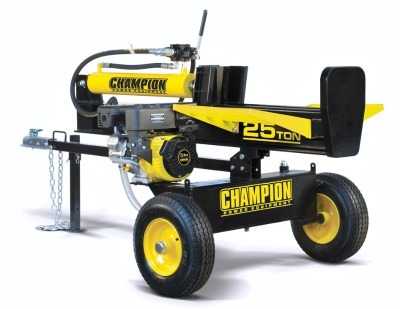 The Champion 92221 22-ton log splitter has an impressive reputation, and is very likely to satisfy anyone with less than a borderline commercial operation. Keep in mind the size of logs that one or two people can move easily, and this splitter ought to be able to handle all but the largest. The impressive manual and the strong technical assistance available from Champion makes it accessible even to the novice equipment operator. The model pictured below is actually a newer model than the 92221, it is the 100251 splitter rated at 25 tons. Costing less than the older model and more power!